Home > Remembered > David Masondo, another star gone! Co-founder of the Soul Brothers, David Masondo, has died after spending almost two months in the Garden City Hospital in Johannesburg. This was confirmed by the Managing Director of Johan Sibiya Music Promotions where Masondo recorded his last album. Musician David Masondo was born in Hammersdale also known as Mpumalanga, Durban in 1950. He started his musical career by doing gigs in townships with Groovy Boys. He later co-founded the Soul Brothers, the band that has successfully popularized the South African soul concept (umbhaqanga). He was the lead vocalist of the band, composing many of the songs. The Soul Brothers have recorded over 30 albums since its formation in 1974. Managing Director of Johan Sibiya Music Promotions, Johan Sibiya, says Masondo’s death is a huge loss to the music industry. “I would like to confirm that our traditional singer David Masondo has passed on in Johannesburg hospital. We had hope that he will be ok but unfortunately we have lost him. I would like to say to all the followers that we have lost an icon, a father and a person who we were looking forward that he is still going to leave his legacy for the youth of South Africa. May his soul rest in peace”, says Sibiya. President Jacob Zuma also conveyed a message to the family and fans of the late star David Masondo in a Press Release . Masondo’s burial was conducted this morning with several mourners and well-wishers at the memorial celebration of the star. 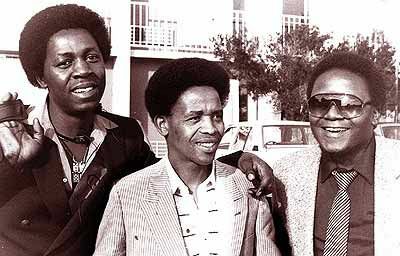 STALWARTS of South Africa’s music scene, the Soul Brothers have recorded over 30 albums since their formation in 1974. While their costume, choreography and some harmonies bear comparison to the American Soul music which inspired them, the group originated a sound and style which captivated South African audiences, most especially amongst migrant labourers who under Apartheid, were forced to leave rural homes to seek work in the cities. The Soul Brothers themselves trod this path to Joburg, and it was this shared frame of reference which endeared the group to the massive working class audience of South African cities. The band was built around the rhythm section comprising bassist Zenzele “Zakes” Mchunu, drummer David Masondo, and guitarist Tuza Mthethwa who first played together in the “Groovy Boys?in Kwazulu Natal, and later as part of the “Young Brothers? It was in Joburg that keyboardist Moses Ngwenya joined to create the Soul Brothers, and David Masondo made the move from drums to lead vocals. The combination of Masondo’s quavering soprano voice and Ngwenya’s percussive Hammond organ playing gave the Soul Brothers a unique and instantly recognizable sound. This core rhythm section was typically augmented with a brass section, guitars, and multiple vocal harmonies. Although the Soul Brothers enjoyed massive acclaim and commercial success, the audience remained limited to South Africa, and neighbouring states. In 1983, members of the group travelled to Botswana, where they worked with the then-exiled Hugh Masekela, affording a mbaqanga underpinning to his seminal “Technobush” album. Car crashes saw the deaths of three band members in 1979, and then bassist and founder member Zakes Mchunu in 1984. Despite these setbacks, Masondo and Ngwenya continued, performing with an expanded group that included not only musicians, but dedicated dancers. David Masondo. © Steve Gordon The Soul Brothers visited UK and Europe in 1990 on their first international tour. Despite international releases, the group remain primarily a domestic phenomenon, who continue to notch album after album achieving gold status. They also operate their own successful recording, publishing and entertainment companies.